David Robertson, who is the creator behind Fred Egg Comics, has asked me to be a guest artist in the third issue of his Dump series. David and I collaborated on a one-pager for the previous issue and I was pleased he asked me again. Perhaps inspired by my strip for Double Nickels Forever, he wrote a music based strip for me to draw. Below are my initial sketches based on his script. 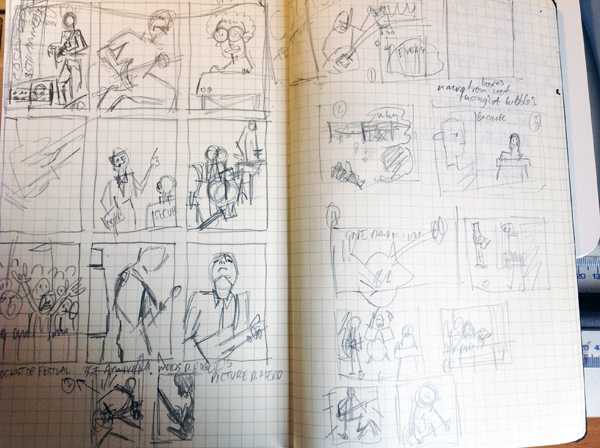 On the right hand page are my initial roughs, and on the left is the more detailed thumbnail layout. Look out for Dump issue 3 soon to see the final page.